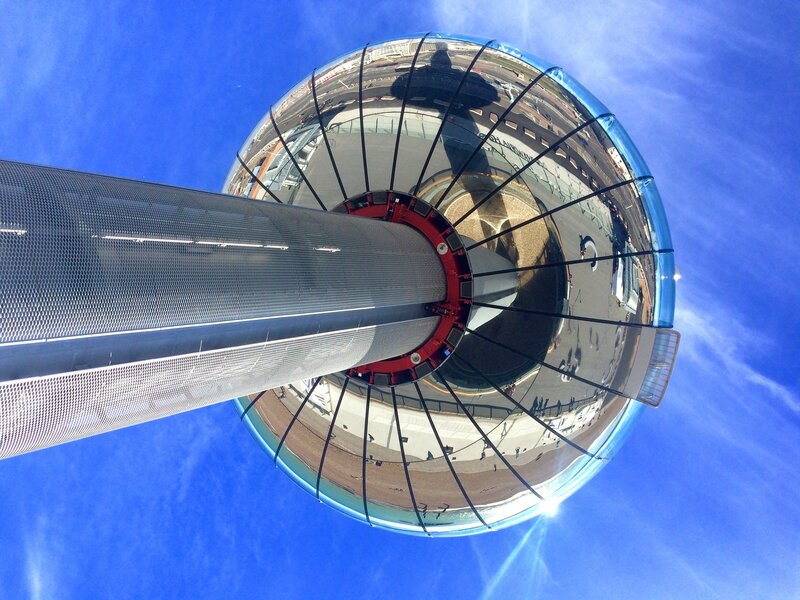 The latest attraction in Brighton, the i360, opened a few weeks ago to much fanfare and a bit of grumpiness. On the website, British Airways who are behind the project proudly proclaim, “Take a flight to the skies and see Sussex as you have never seen it before. Glide up slowly to 450 feet high to enjoy breath-taking 360 degree views of up to 26 miles from the world’s first vertical cable car.” Janet Street-Porter, in the Independent, described it as “naff” and “an expensive and hideous eyesore”. At ground level, the locals refer to it as the ‘donut on a stick’. On a sunny day, it stands out like a shimmering silver time machine capsule majestically rising above the rooftops. 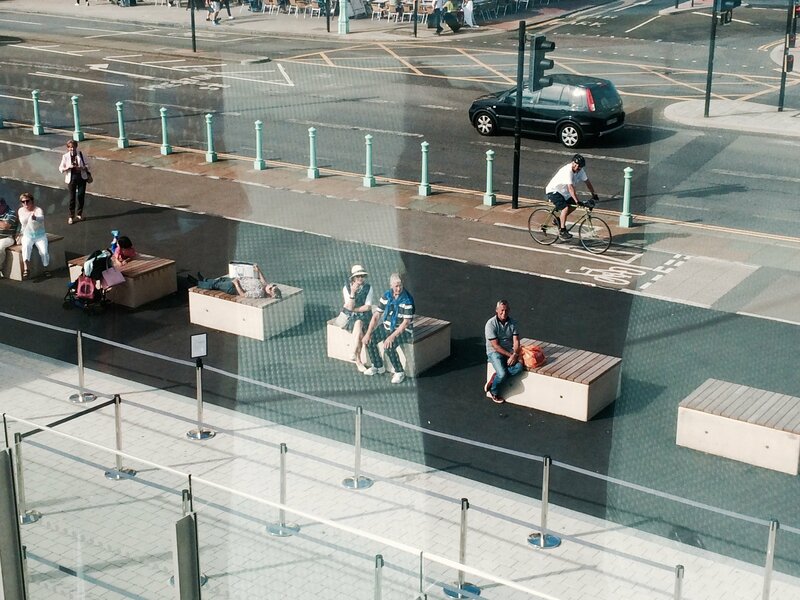 In the first three weeks of it’s opening, over 100,000 visitors have coughed up £15 each to have a ride in it. That is a lot of people and even more dosh. 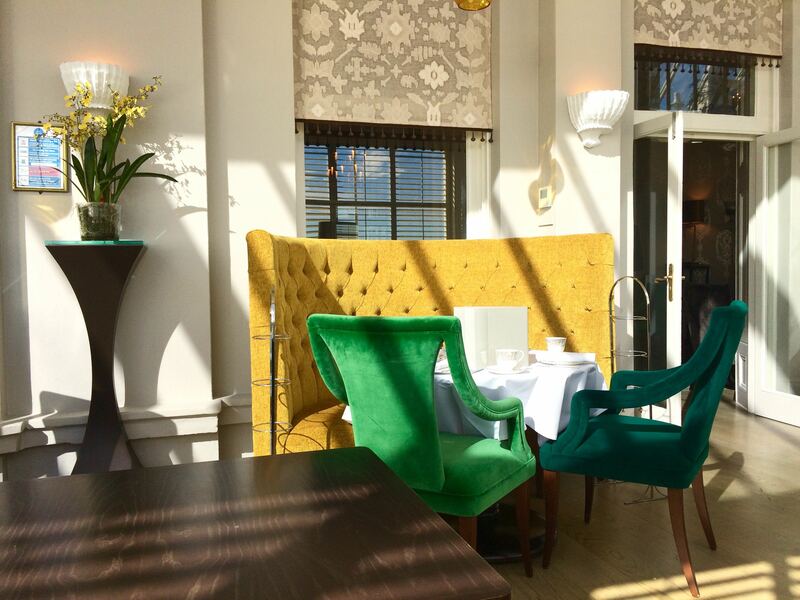 R and I went a month into its infancy, on a shiny sunny Tuesday afternoon. As we entered, we were screened and patted down as if going on a flight. 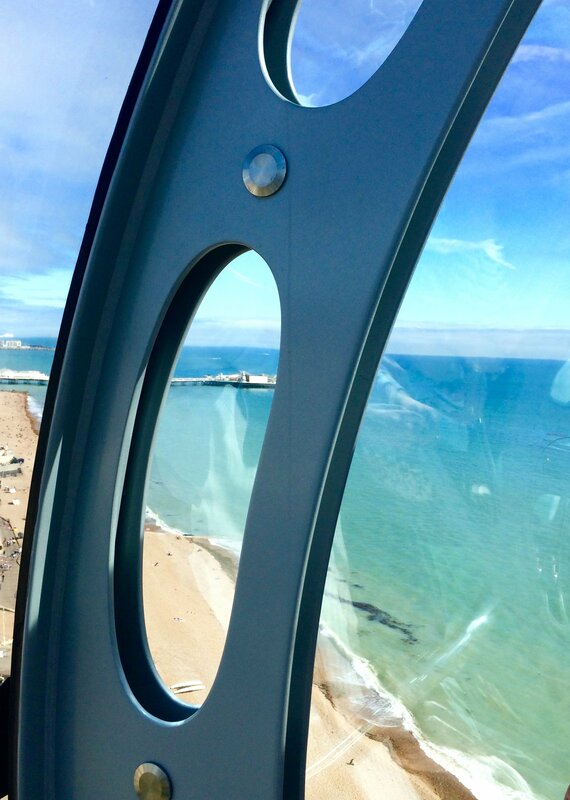 Once inside the capsule, we found our spot to view Brighton as never before seen. We waited with much anticipation, chatting and eyeing up the other people on board, who were snapping merrily on their smartphones. At one end, was a bar selling the local NyeTimber champagne. We resisted, wanting to go up and down before celebrating. Other visitors, however, were less restrained, already in holiday mode, happy to neck back the bubbles at any occasion. There were no announcements, no British Airways muzac or welcome. Instead, the capsule simply started moving upwards, almost imperceptibly and silently, at first. 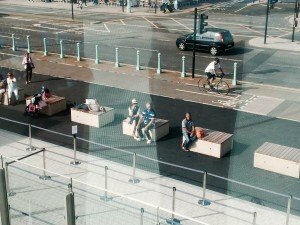 It was smooth and gentle; watching the people on the ground becoming more matchstick-like and the cars move slower, and more blocks of Lego-like flats appear on the expanding horizon. The coastline west and east swept into toy town fringes, of groynes, lawns and shingle. Then just as it had started moving the bubble stopped and our ears popped. It was all a bit of an anti-climax for what was the final view before we started our slow descent. There was no sighting of France, nothing of the Isle of White and even less of the suburbs of London. Just a bit of a blur at the edges. The South Downs were there in the distance, but unlike experiencing them from favourite viewing spots, when walking in Firle, Devil’s Dyke or Chanctonbury Ring, there were no little villages or cricket pitches unfolding before your eyes or fresh new sights around each corner. No distant sounds of cars, cows, planes or trains. No wind in the hair or country smells. No unexpected sights or quotidian human traffic. Just chirpy people taking lots of selfies. Ironically, by far the most spectacular view was from outside the capsule – looking directly up from below, as the shimmering donut descended down onto bystanders waiting their go, from a brilliant blue sky. 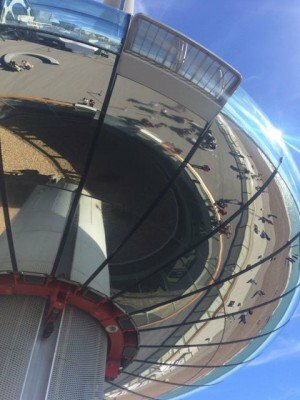 Like the transmogrifying Anish Kapoor Bean in Chicago, you could see distorted reflections of yourself and others, growing larger and more funfair-like, as the capsule finally came to rest. On exiting, you are bundled into a basement room, a cornucopia of tat. You are suddenly reminded, that just after being screened at the entrance you were photographed for a personalized souvenir. 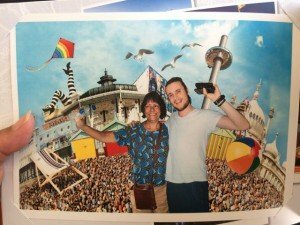 For the princely sum of £21.50 you could now buy a paper album, curated with your mugshot set against backdrops from different eras and places in Brighton. Victorian, modern, and space age. Unsurprisingly, no-one was buying them. R snapped some of the pictures as we flicked through the pages with his iPhone. Then we went across the road and had a delicious cream tea in the Victoria Terrace at the Grand Hotel – that cost less than the tacky booklet. 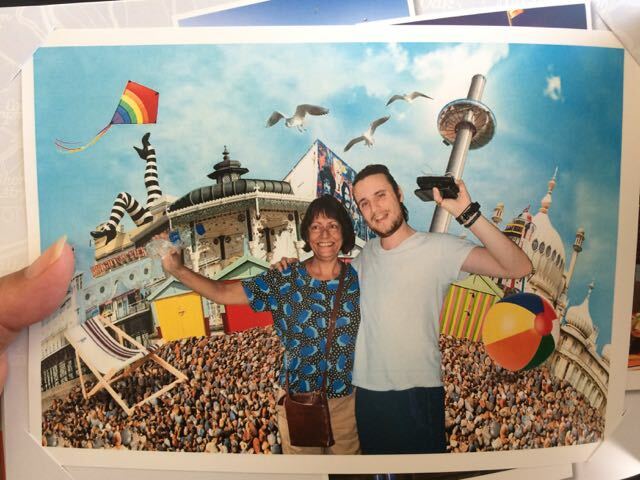 It was a real treat, with all the trappings, and on top of that, fine views of the sea and pier.